Oberheim Electronics, Inc. 10th Anniversary advertisement from page 5 of Contemporary Keyboard Magazine April 1980. I'm kicking myself for missing this perfect opportunity! On December 31, 2009, it would have been the 30-year anniversary of this 10-year anniversary advertisement from Oberheim. I flip through old issues of CK quite a bit, but I felt like I was reading this issue of CK for the first time when I came across this ad recently. Its placement in the magazine is perfect - page 5, directly opposite the Letters section. The design is also fantastic - the white space... the fonts.... the logo at the top immediately recognizable. But as I read through the opening paragraph, something seemed odd. 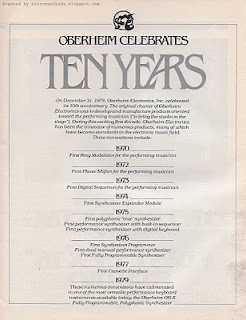 I had always thought Oberheim Electronics started in the 'early' 70s, but not as early as 1970. Even Wikipedia states the company began in 1973. And other sites have taken this '1973' date and repeated it on their sites as well. Time to do a bit of digging. I did a Google search to try and find a pre-1973 reference to Oberheim Electronics. The one reference that stood out was an article from 1984 by Harald Bode entitled 'History of Electronic Sound Modification" found on MATRIXSYNTH. Reference '44' on page 9 of the PDF points to a presentation made in 1970 by Tom Oberheim entitled "A 'Ring Modulator' Device for Performing Musicians' - almost the exact same wording that is used in this ad under '1970'! Interestingly, on page six of the PDF, Bode also states that "one of the successful phasers of the early times was the Maestrophaser, designed by Tom Oberheim". Certainly a reference to the phase shifter listed under 1972 in the ad. So, Tom Oberheim was definitely designing and building gear as early as 1970 - but did the company Oberheim Electronics exist? I decided the easiest way would be to ask Tom Oberheim himself. And, in fact, it was started in 1969. "Oberheim Electronics was incorporated by me in California in December 1969. The company remained in my hands until May 1985 when Oberheim Electronics's bank foreclosed on the assets of the company and sold them to the ex-lawyer for Oberheim Electronics. At that time Oberheim Electronics was put into Chapter 7 bankruptcy and ceased to exist. A new company, ECC Development continued with the assets. I briefly worked for that company. After early 1987, all my connections to the "old" Oberheim entities were severed. It is my understanding that sometime after that, ECC sold or otherwise transferred the remaining assets to Gibson, including the Oberheim name and logo. As far as I know, Gibson still owns the Oberheim name and logo." But enough about the past... If you live under a rock, you may not be aware that Tom Oberheim has reissued his Synthesizer Expander Module (SEM) - the same one as mentioned in the ad under '1974'. You can find more information on the SEM on his Web site - TomOberheim.com. Definitely check it out! "I have had a copy of the ad on my wall in my office since it came out in 1979." End note: Reading through the list of achievements in the ad, I instantly recalled MATRIXSYNTH's 'The first synth to...' list. Taking a look, the only achievement in the ad to make the list looks to be the first fully programmable synthesizer (although listed in a different year). Take a look and see where any of the other achievements may be added. Awesome celebration/history lesson. And how cool to hear from the man himself! Nice post.